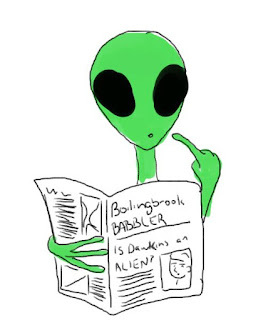 As part of their effort to promote nihilism in high schools and universities, the Secular Student Alliance mentions The Bolingbrook Babbler in a fund raising post. SSA board member Jennifer McCreight, who writes the Blag Hag blog, rewarded donors with a picture of an alien reading The Babbler. The post is part of the SSA's week long fund raising campaign, which will conclude in a "blogathon" on Blag Hag. "I'm very flattered that Jennifer mentioned us." Said Editor Sara Langston. "Obviously the Secular Student Alliance thinks we're a threat to their efforts to destroy morality and promote Satanism." SSA board members could not be reached for comment.